To quickly recap, your business has one or more physical locations that depend on people being able to find you both online and offline. The challenges you face are that customers don’t know you exist, they are unable to engage with you and they can’t physically find you. 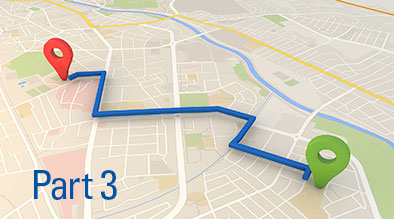 There are five steps you can take to begin the process of ensuring your business is found. Steps 1, 2 and 3 were discussed last week. This week we finish up with steps 4 & 5. Having a presence in local directories and maps is a good start, but you want to go a step further to stand out from your competitors and gain the trust of your customers. Begin by putting images on your profiles. Nothing is more compelling than visual elements that showcase your business’s physical location. Letting your customers see who they are doing business with builds a level of comfort. Interacting with consumers on social networks takes this even further by giving a voice to your brand. Show customers that you care and stand behind your products and services. Similarly, paying attention to what people say about you on review sites is also important. While positive reviews are always preferable, use negative reviews as an opportunity to build more trust. Reply thoughtfully and accurately to any concerns, showing consumers you care about their experiences. While the benefit of trust is obvious from a human standpoint, there is also a benefit for search ranking. While the exact impact is debatable (and likely changes every year), as Local SEO Guide points out in its 2016 Local SEO Ranking Factors, “things like reviews and photos and having an Owner Verified (OV) profile correlated with positive GMB performance”. Pro Tip: Utilizing commonly occurring words in reviews about your business (or your competitors) is a great way to come up with fresh content for your website. Common themes among paying customers are likely to be important to new customers too. Tips one through four have focused on enhancing your presence everywhere but your website. However, to close the loop and really present your business in the best way possible to people and search engines, take some time to check on a few key elements of your website. Start with the same critical NAP information you use for directories and maps. Make sure your business contact information is easy to find on the site. Put it in your footer as well as your contact page. Formatting this information with structured data (schema.org) helps to ensure that search engines also understand exactly who and where you are, and makes you more likely to rank well in voice search. Verify that the content on your site supports the enhanced information you share in your listings. Do you talk about your business category anywhere? Are there sections of the site that discuss your unique selling points and value propositions? And finally, make sure that your website provides a strong mobile user experience. Nothing derails a potential customer like clicking to your website on their phone only to discover they can’t actually see anything on the site or navigate without squinting and stabbing at tiny links that don’t go to the right places. Since Google announced they are moving to a mobile-first index, having the right structural elements like title tags, heading tags, and schema on your mobile site is potentially even more important than having them on your desktop site. Pro Tip: Google offers a great free tool that analyzes your site and gives you tips on how to improve both mobile and desktop friendliness. So you’ve done all the legwork and addressed the challenges. How do you know that it is positively impacting your business? Are you truly meeting both search engine and customer needs to drive more traffic to you? Having a strong local presence will result in your business getting more online visibility for a variety of searches, as well as more phone calls, more clicks on Google for directions, and more people in the door. One of the simplest ways to measure the increase in impressions and phone calls is through Google Search Console and Google My Business Insights. The Search Console shows over time not just how many clicks your website is getting, but how many impressions you receive in search. A person doesn’t necessarily have to click to become a customer: if the search result shows the information they need to be able to call or find you that is a win even without the click. 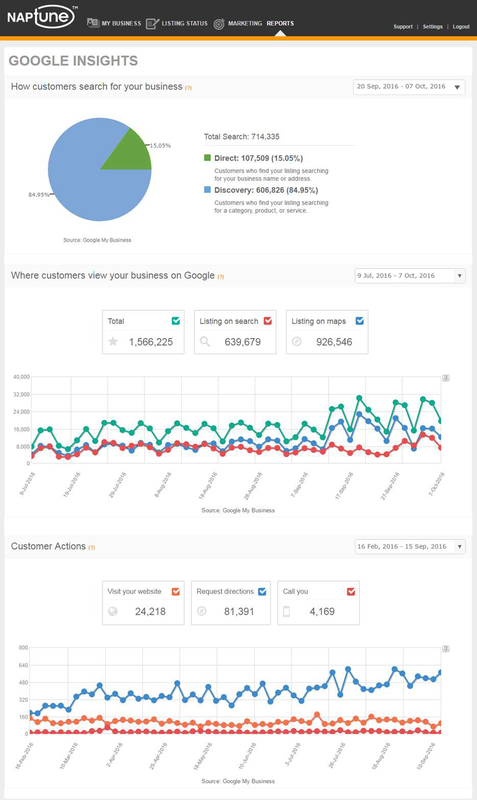 Google My Business Insights take that one level deeper and actually track the number of times people click for directions or to call your business directly from your GMB listing. Screenshot of an upscale boutique hotel in San Francisco’s Union Square district. The GMB and Search Console typically only show data for up to 90 days, so you’ll either want to export data regularly, or use a tool like Milestone’s NAPtune that allows you to store your data so you can see bigger trends over time. Once you have made the effort of creating a strong and accurate presence and are tracking your success, continue to drive those customer interactions by monitoring your presence and making sure your information remains updated wherever it can be found. The Internet is not a static document, so make sure you have a plan to monitor and maintain your business data across the web. Ensuring consistency through ongoing monitoring and updating of your profiles builds trust and awareness with search engines and people. Accurate information when customers want it, wherever they try to find it is the key to getting them in the door and winning their business. If you have additional questions please leave a comment below, visit our website, or email us at [email protected]. For an easy to read PDF of this blog series, download the white paper – 5 Ways to Ensure Customers Find Your Business.